The Simpsons just broke Gunsmoke‘s record. 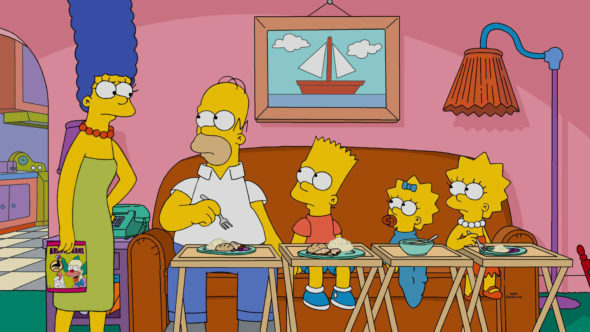 FOX has renewed The Simpsons for its 29th and 30th seasons. This renewal will take the long-running animated series to a record-breaking 669 episodes. That is the largest episode count for any scripted, primetime US television show. Gunsmoke previously held the record, with 635 episodes. “Take that Gunsmoke! You lost a race you didn’t even know you were running!,” said Homer Simpson. Gracie Films Production produces The Simpsons in association with 20th Century Fox Television. James L. Brooks, Matt Groening and Al Jean are the executive producers. The voice cast includes Dan Castellaneta, Julie Kavner, Nancy Cartwright, Yeardley Smith, Harry Shearer, and Hank Azaria. The Simpsons hit the 600 episode mark, last month. Do you think the show is likely to end after its 3oth season? What do you think? Are you a fan of The Simpsons TV series? How long do you think the FOX show can last? Should The Simpsons end with season 30, or keep going? Let us know, below. Sorry lady and gentlemen it is going to end al jean spoke two years ago that season 30 is last for this era it will last more than 30 years last season ending after said to told me in charge of it. Family guy and South Park at it and American dad that it. To be honest, I haven’t watched the show for 2 decades now. They’ve already jumped the shark to be honest. That said, Happy Days continued running for quite awhile even after they did that, so who knows how long they’ll beat the dead horse. It not good let go after season 30 now it season 29 I finished with it not great getting noise annoying show I hate it. Sorry lady and gentlemen it is going to end al jean spoke two years ago that season 30 is last for this era it will last more than 30 years ending after said to told me in charge of it. It should have ended 20 years ago, at the end of season 8 (and even that is pushing it, as by that point the quality of writing had noticeably dropped). The only reason why I hope the show stops at Season 30 is because, 1 of the EPs said they’ll never produce another movie while the TV show is in Production.